When i walk down the street while listening to a podcast or music with my headphones on, i turn the volume of my mp3 player to almost the maximum of 30 out of 30, to mask out all the street noise. Then at night, when i lie in bed – in a quiet and dark environment – and listen to the same audio files again, i notice how my brain, body and perception adapts to the noise-free and stimulus-weak surroundings. I start out with a volume around 5 and then, while my brain slowly relaxes and shifts from beta (alert) to alpha (relaxed) to theta (drowsy) brainwave frequencies, slowly turn it down to the lowest possible volume mode: 1 out of 30. I don’t know how the dB scaling of my mp3 player is tuned, but it still amazes me every time, how extremely different the sound-environments are we live through every day. Our lives seem to be a competitive dynamic between the necessity for stimulus (visual, auditory) in order to learn and adapt, and the necessity for sensory deprivation in order to relax, focus and give your brain a time-out to reorganize. Yet our worlds have become more and more sound polluted. Complete silence is almost non-existent in our society. If we want to relax, but don’t have the necessary silence around us, we have to create the next best thing: noise – the good kind of noise – white noise! 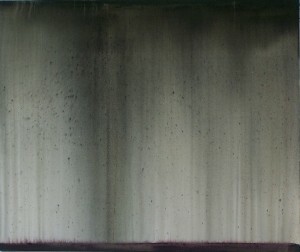 Lately I’ve been discovering the calming effects of steady uniform noise on my brain. A source of natural random noise – rain. Our perception is tuned to notice change. Our vision perceives forms and colors that move and morph in front of us. If confronted with a steady and unchanging field of color the brain turns off its visual processing until a change occurs (see snow-blindness). Our hearing sense is similar, it is trained to notice and focus on sharp sound level changes. If we are in a uniform sound environment our brain has nothing to process and tunes out. 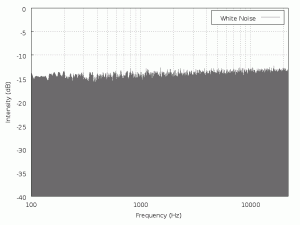 White noise contains all human-perceivable frequencies, it perfectly masks out all other sounds by supplying a steady background noise level. Our brain is not able to pick out isolated sounds anymore and is therefore not busy focusing on sound sources. The less external stimulation the better we can relax during the day or have a more restful sleep at night. Natural sources of random noise like waterfalls, ocean surf, rain, wind, etc. have similar calming effects on our brain. SimplyNoise generates white noise, pink noise, and brown noise for you, either to add ambient noise to a rather silent environment (or mask your tinnitus) or to block out audio distractions. I notice i can focus a lot more on tasks like reading and writing once i stream these noises into my ears. And it also puts my mind to rest when trying to fall asleep. The little colorful plastic boxes house a speaker and a soundchip loaded with 9 drone-like loops. I was always intrigued by the simplicity of design and purpose of the little music machines. But for some reasons I always ended up not buying one, next time i’ll see one, I’ll change that. 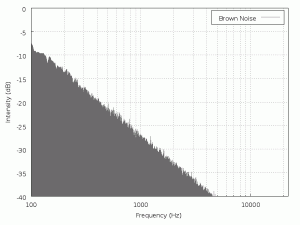 A steady, monotonous stream of the entire spectrum of frequencies the human ear can perceive. 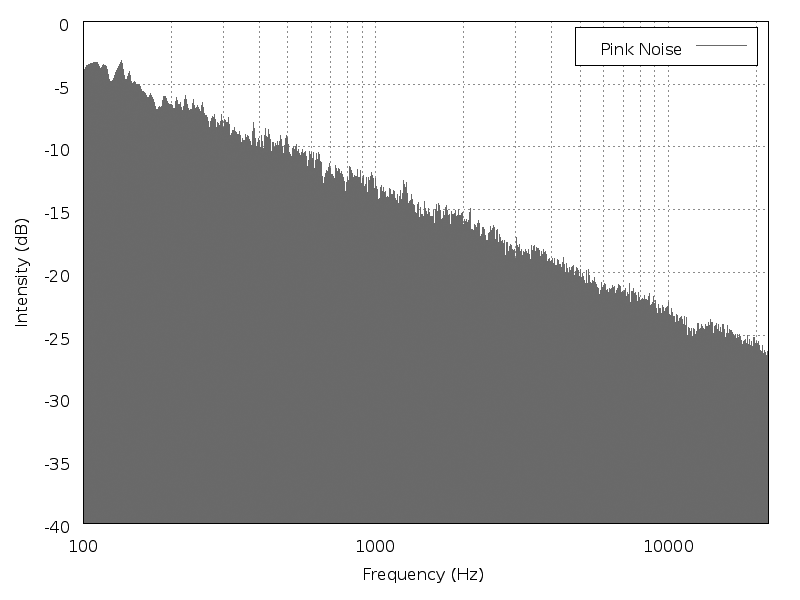 The spectrum of pink noise decreases logarithmically, so that every octave contains the same amount of energy (equal power between frequency range 40-60Hz and 4000-6000Hz). Since our volume perception is logarithmic – a doubling or frequency is perceived as a doubling of volume – with pink noise we perceive approximately equal magnitude on all frequencies. 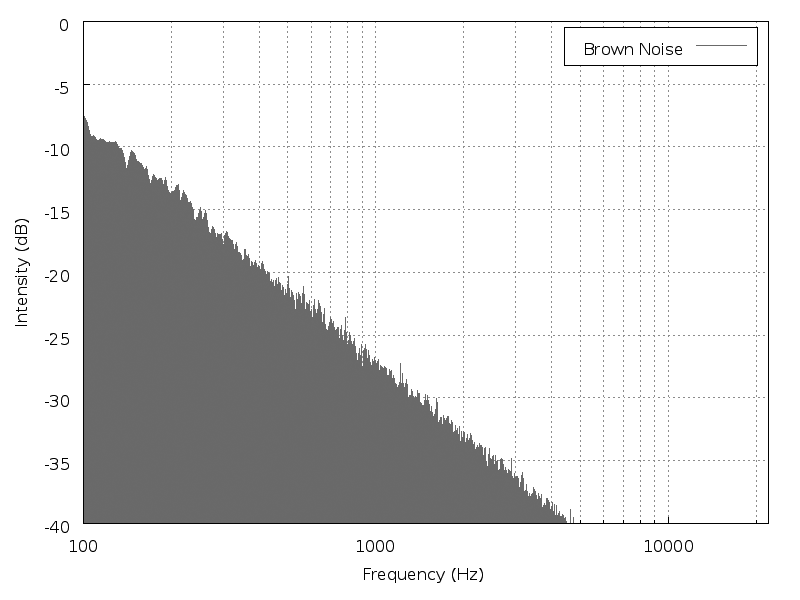 Brown noise creates a spectrum where the power density decreases 6 dB per octave with increasing frequency. The name comes from the fact that it can be generated algorithmically with Brownian motion. The noise of silence, a barely detectable audio frequency, often appearing prior to catastrophic events. 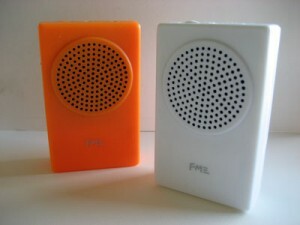 Posted in meta, Research and tagged 2010, brainwave, Buddha Machine, hearing sense, noise, perception, senses, sound, white noise.